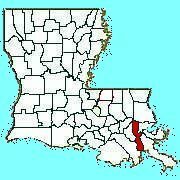 Jefferson Parish was established in 1825 and was named in honor of Thomas Jefferson. At the same time, volunteers were found who were willing to coordinate the collection of databases and generally oversee the contents of the web page. The Louisiana GenWeb Project is an extension of the KY GenWeb Project. The person responsible for Jefferson Parish is Cynthia Marques Craddock. Please contact me, if you have a desire to add your data to the database.